A couple of weeks ago we headed out to go wine tasting in the Valley of the Moon (Sonoma Mountain AVA) near Glen Ellen. It was a beautiful, sunny day so we wanted to combine wine tasting with some outdoor time. 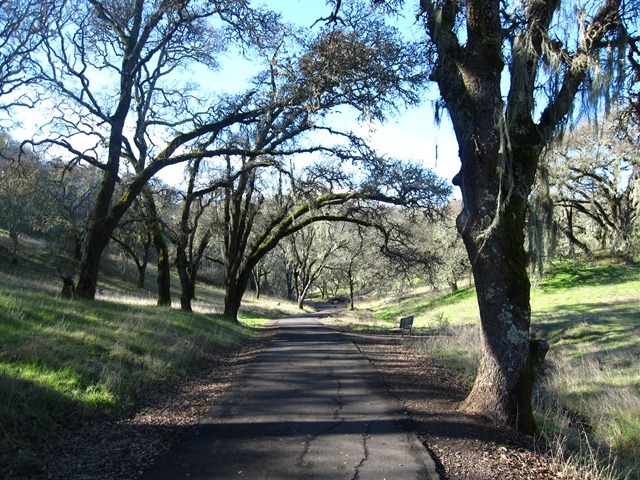 The paved paths of Sonoma Valley Regional Park were the perfect answer! 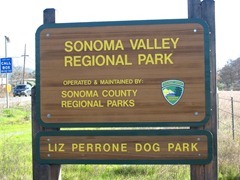 Right outside Glen Ellen, the park offers both paved and unpaved trails, a dog park, picnic tables, barbeque (BBQ) facilities and a port-a-potty. The paved trails are fairly level and make for an easy stroll. They’re great for families with small children in strollers and those just out for a relaxing walk. If you want a little bit more exercise there are lots more unpaved trails. These, too, are pretty easy. They’re mostly level, wide and well-maintained. Paved trails lead through the oaks at Sonoma Valley Regional Park, near Glen Ellen. Springtime brings particularly spectacular wildflower displays to the park. To really appreciate the beauty of the display, though, you should be prepared to get off the paved trails and explore the park more thoroughly. The un-paved trails provide sweeping views of fields carpeted in brilliant color and dotted with oaks. If that doesn’t work for you, don’t worry – even from the main paved trails the colors are amazing. Any time of year, Sonoma Valley Regional Park would make a great spot for a lunch time picnic on a day spent wine tasting in the Valley of the Moon. Glen Ellen is home to several wineries. Benziger, Chateau St. Jean, Ledson, St. Francis, and Kunde wineries (and their tasting rooms) are all nearby.